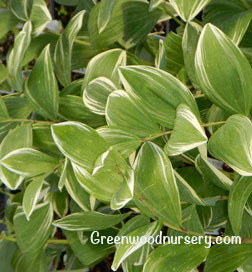 Solomon's Seal Variegated is a native perennial beauty for the shaded woodland garden. Selected as Perennial of the Year for 2013. Grown mostly for its clean variegated, soft green foliage which turns yellow in fall, Solomon's seal is a charming plant for any shade landscape. Standing about 18" tall and arching slightly at the top, the burgundy, arching stems of this shade loving plant carry the foliage and flowers gracefully. This is a great addition to the woodland garden, brightening up shaded areas. During still spring evenings, the flowers exude a subtle lily-like fragrance. The stems are beautiful in cut flower arrangements. Solomon's Seal is a natural plant for the shady woodland garden even tolerating heavy shade. Deep, rich, moist soil is best. It is sometimes slow to establish itself, but is very long-lived and easy to maintain once it does. This shade loving perennial grows to a height of 18/24 inches with a 10 to 20 inch spread. Divide plants in the spring or fall.